Your Lake Forest Dentists Provide Dental Implants for Patients! Tooth loss is a serious issue that can result in a complete loss in the functionality of teeth. Even dentures – a restorative appliance used to mimic the structure and ability of natural teeth – have many disadvantages that outweigh their benefits. Dental implants with Lombardi Brothers Dental, however, can provide the functionality you need in a natural-looking smile. Our Lake Forest office offers the latest technology for precise and effective implant placement. 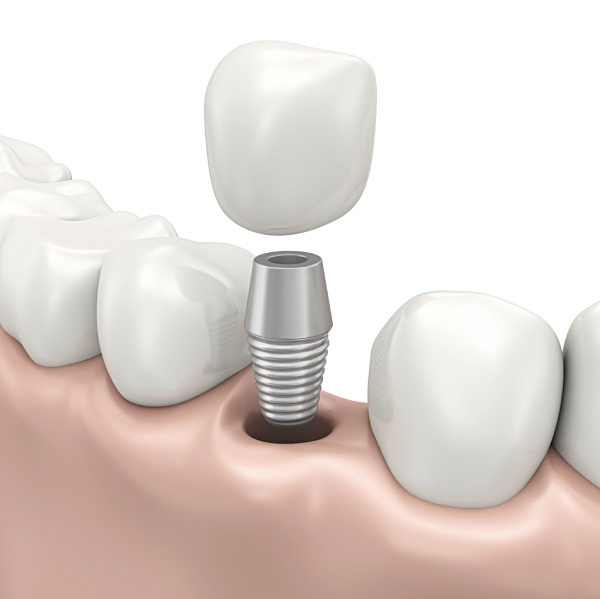 Dental implants consist of a titanium “root” and an acrylic crown. The root is surgically placed into the jawbone with the crown capped on top. Once the healing process has begun, the titanium screw will begin to integrate itself into the existing bone tissue, making the implant stronger and more durable. Dental implants can replace anywhere from one tooth to all twenty-eight teeth, but involve no additional reshaping of adjacent teeth. And because each implant is placed individually, patients can practice regular oral hygiene when maintaining their implants. During your initial consultation, we will assess your medical history and determine whether dental implants are right for you. Then, using 3D cone beam technology, a clinical and virtual implant will be created, which is also customized according to your treatment plan. Your pre-planned treatment is sent to Germany, where a surgical stint guide is created for your specific procedure. Afterward, we will schedule an appointment for your implant placement. Three-dimensional cone beam technology allows your implant procedure to be planned and virtually executed before you even sit in the dentist’s chair. Using the highest quality in implants, research, and development, your Lake Forest dentist will place implants that will last for years to come. For more information about dental implants or to schedule a consultation, call our Lake Forest office today! Dental implants can provide a fixed and permanent restoration for your missing teeth. Call Today!